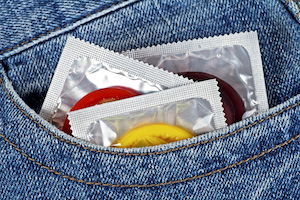 One of the go-to excuses men give for not wearing a condom may soon be obsolete. Researchers at Boston University (BU) have developed a continuously self-lubricating condom, responding to a challenge issued by the Bill & Melinda Gates Foundation in 2015 to explore new technologies that would increase condom usage around the world. The researchers received a $100,000 grant from the foundation, and after more than three years of research and testing nearly 1,000 formulations, the BU team believes that it has found a winning combination of latex and lubrication, thanks to a thin polymer coating. The polymer captures moisture from water and body fluids and traps the liquids on the condom surface, according to a press release on the BU website. As a result, the condom remains consistently slippery during sexual activity for extended periods of time. In a paper published in the British journal Royal Society Open Science, the researchers discussed the materials and surface treatment technique that they used: “We recently reported the synthesis and characterization of hydrophilic two-component coatings, which we demonstrated can be covalently attached onto latex surfaces through a UV-induced reaction to afford increased hydrophilicity. The coatings (abbreviated HEA/BP/PVP) comprised (i) photo-macroinitiators composed of 2-hydroxyethylacrylate and benzophone units (HEA/BP) and (ii) hydrophilic polymers (e.g. polyvinylpyrrolidone, PVP)." Put another way, "we have a coating on the latex that maintains all the properties of latex,” explained team co-leader Mark Grinstaff, a College of Arts & Sciences professor of chemistry and a College of Engineering professor of biomedical engineering, in a press release on the BU website. “It’s durable and strong. It is a coating that when you get a thin layer of moisture on it, it becomes slippery. It’s quite exciting technology,” added Grinstaff, who partnered with Ducksoo Kim, a School of Medicine professor of radiology and Boston Medical Center Director of Interventional Radiology, on the project. Conventional condoms with silicone-based lubricants repel moisture and can be tacky and messy. By making condoms more comfortable, the thinking goes, people will be more likely to use them and, thus, prevent the spread of sexually transmitted diseases, which have been on the rise, according to the Centers for Disease Control and Prevention. Condoms are also 98% effective in preventing pregnancy when used properly. The new condom has not been tested yet, but the researchers did organize a touch test, which produced promising results. Individuals were given a standard, nonlubricated latex condom; a standard condom with a personal lubricant applied to it; and the self-lubricated condom developed by Grinstaff’s team. Eighty-five percent of study participants who compared the three condoms found that Grinstaff’s was the most slippery to the touch. “Those in our survey who don’t typically use a condom said they would consider using a condom if it stayed slippery like this,” said Grinstaff. That’s music to Stacy Chin’s ears. A co-author of the study, Chin is CEO of Boston University spin-off HydroGlide Coatings, which will commercialize the self-lubricating condoms. Her company has raised $1.4 million in funding from the NIH Small Business Innovation Research program, the Massachusetts Tech Transfer Center, and the Massachusetts Life Sciences Center, and she hopes to have a self-lubricating male latex-based condom on the market in two years.